This black and white frontispiece to the  University of London Press, Ltd. Abridged reprint, depicts Ellen arriving at Aunt Fortune's farm. 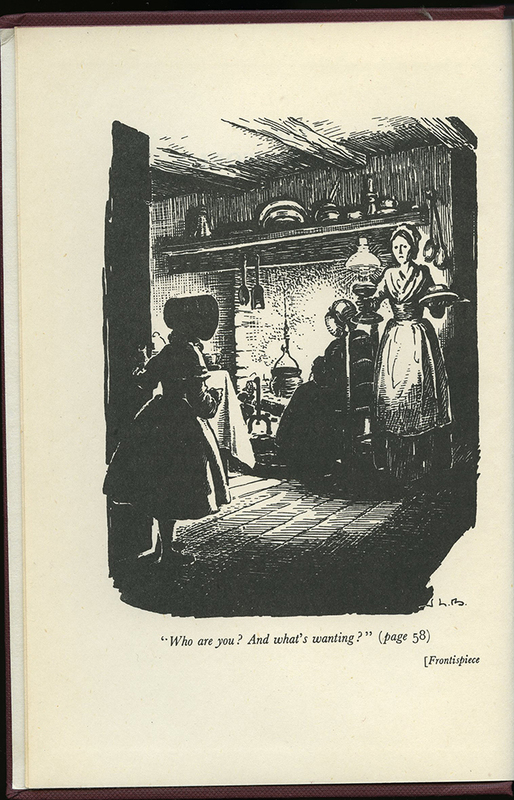 In the illustration, Ellen's silhouette is standing at the door wearing a bonnet and dress. The fire in the chimney is the only light in the room, illuminating Aunt Fortune's frowning face as she faces Ellen at the door. Aunt Fortune is carrying a lamp in one and and a plate of flood in the other. The grandmother's silhouette is seen sitting in a chair in front of the fire.An inscription below the frontispiece reads, "Who are you? And what's wanting?" which quotes page 58 of the novel. 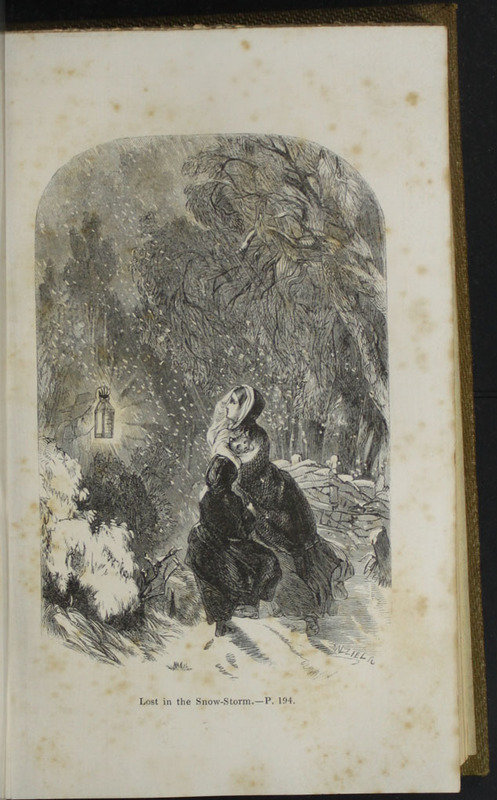 This black and white illustration, appearing on page 194c of the 1853 G. Routledge & Co. reprint, depicts Alice and Ellen caught in the snow storm as they attempt to find their way home after leaving Mrs. Vawse's. 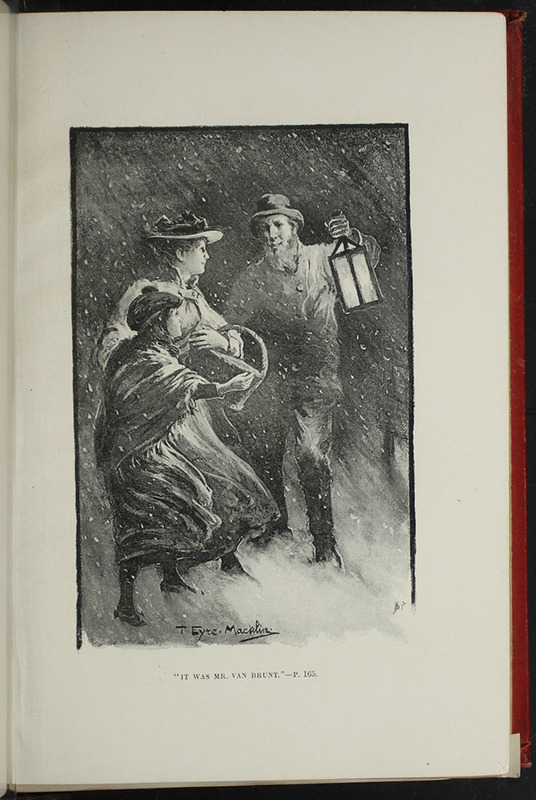 A caption below the illustration reads, "Lost in the Snow-Storm," referencing the scene from page 194 of the novel. In the illustration, Alice and Ellen stand in the snow staring at an approaching lantern that has come into view. Captain Parry, Alice's cat, rests his head on Alice's shoulder as she shields him from the storm. Bare, twisted trees hang over Alice and Ellen, enhancing the sense of confinement in the illustration. Alice and Ellen's dark cloaks stand out against the white snow around them as they wait for the man holding the lantern to approach. The name of the illustrator, Dalziel, is inscribed in the lower-right corner of the illustration. This is the frontispiece to the  William Nicholson & Sons, S.D. Ewins & Co. 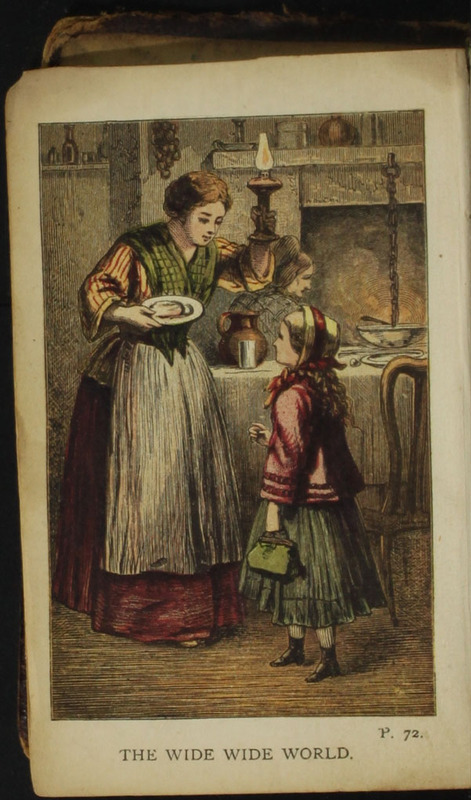 Reprint, depicting Ellen arriving at Alice's while she is making cakes. 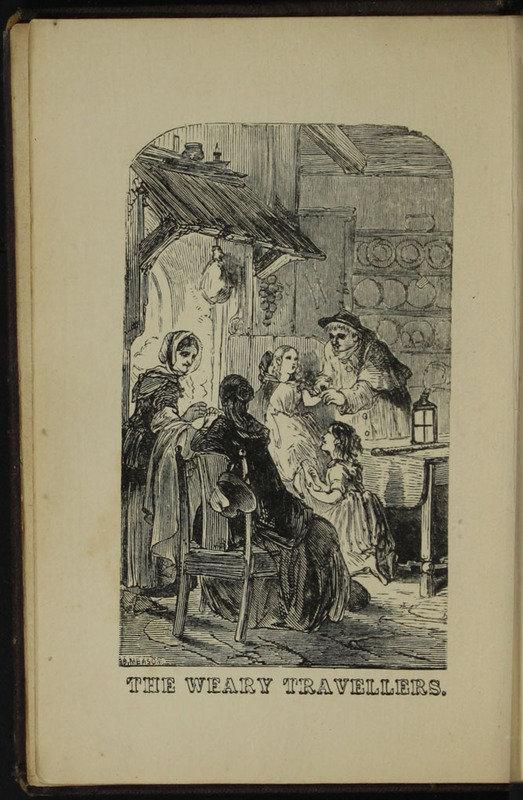 This colorful image depicts a scene from page 72, of Alice, Ellen and Margery, together in the kitchen. Alice is making cakes when Ellen arrives, while Margery sits over by the fire, behind the table. Alice holds a lantern over her head, looking down at Ellen, holding a plate of cakes. Ellen is dressed in her outer wear of the time period. 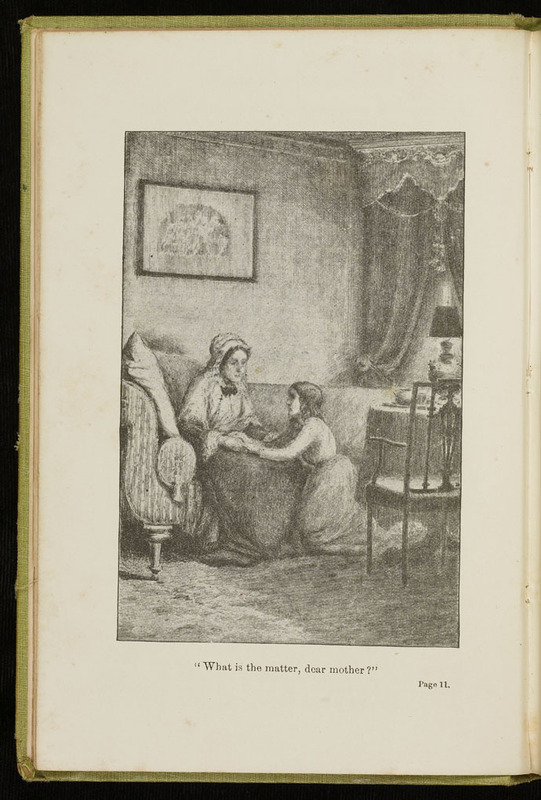 This black and white illustration is from a scene on page 168 of the 1896 Walter Scott Ltd. Reprint. 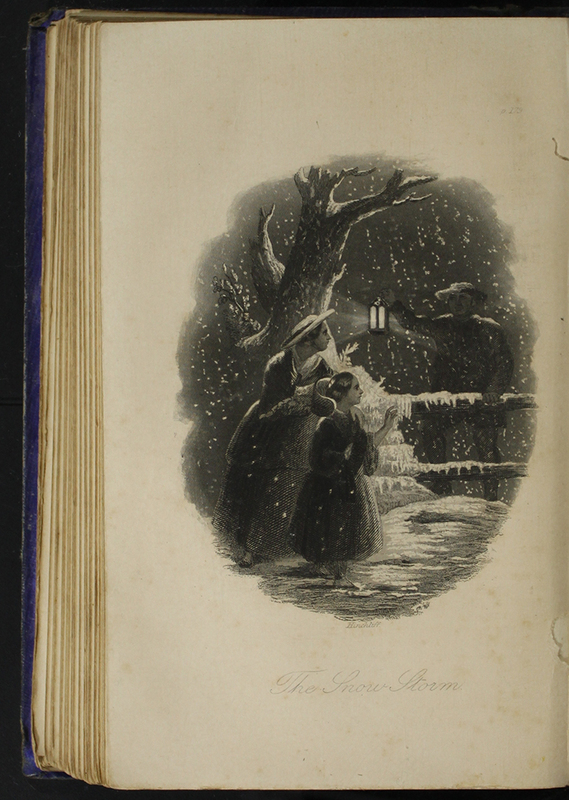 This is the scene where Ellen and Alice are found in the snow storm by Mr. Van Brunt and his lantern. The scene is dark, with snow billowing around, the only light coming from the lantern. This is the illustration on page 178b of the 1853 H.G. 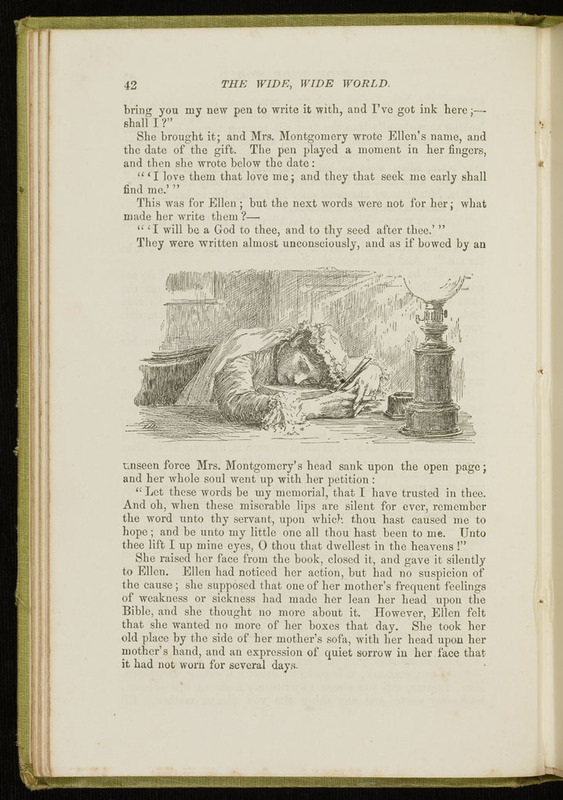 Bohn reprint, Version 1 Depicting Mr. Vant Brunt finding Ellen and Alice in the snowstorm. A caption below the illustration reads, "The Snow Storm." 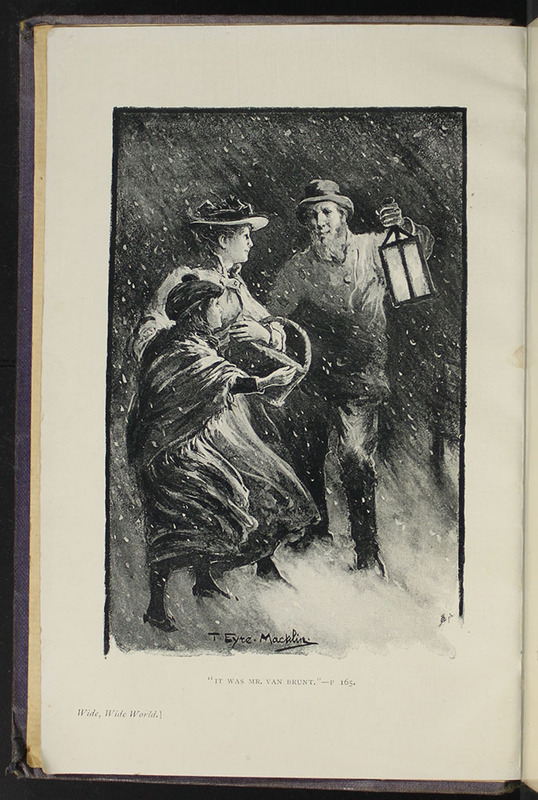 In the illustration, Mr. Van Brunt leans against a snow-covered fence holding up a lantern as Alice and Ellen approach. Alice looks at the lantern warily as Ellen reaches out toward Mr. Van Brunt. A bare tree extends over Alice and Ellen. This black and white illustration, found on page 88a of the  Grosset & Dunlap reprint, depicts Ellen arriving at Thirlwall. 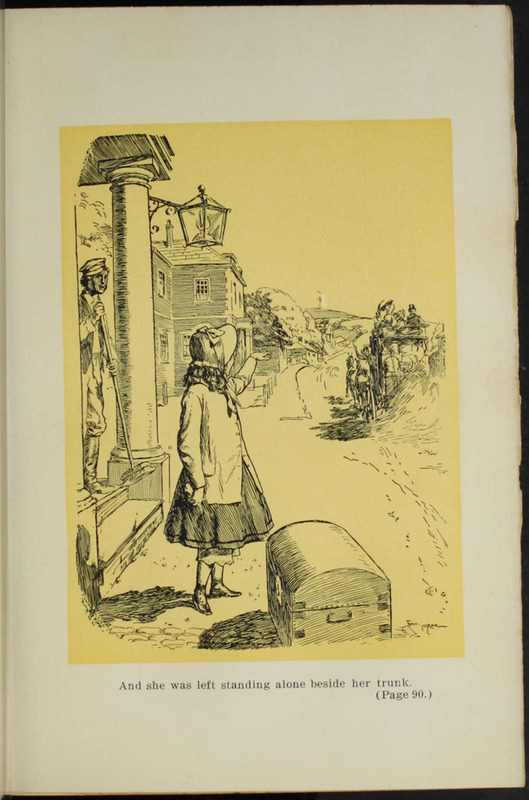 In the illustration, Ellen stans in front of a storefront in Thirlwall wiht her large trunk sitting near her as she waves goodbye to the horse and carriage that dropped her off as it trots off into the horizon. A caption below the illustration reads, "And she was left standing alone beside her trunk." The scene depicted in this illustration is on page 90 of the novel.